One of my favorite activities is trying to come up with ways to make a little extra cash between paychecks. As a kid, I used to ride my bike around the neighborhood and collect discarded aluminum cans from the side of the road. A few kitchen-size garbage bags full of cans would yield anywhere between $5 and $10 dollars. It wasn’t much, but I enjoyed the challenge of finding the cans. Recently, I decided to give scrap metal recycling another try. I had just replaced the radiator in my car and was planning to bring the old one to the scrapyard. What I did was wait a few weeks to see how many other metal objects I could collect in the meantime. At work, I noticed a couple of DVD-ROM drives and computer power supplies in the trash. I dismantled them and saved their metal enclosures in my pile. A few days later, I noticed that someone had thrown away a fluorescent shop light in the alley behind my house. I snagged it, removed the ballast, and added it to the pile. Not long after that, I was given a couple of CD spindles made of high-grade aluminum from work. After a couple of weeks, I was ready to cash in. I took everything to a local metal recycler where they put the steel and the aluminum on the scale separately, then printed out a receipt. I took the receipt to the cashier where I was handed a princely sum of $3.21. That didn’t even cover the gas I used to drive to the recycling center! I was disappointed and I felt like I had wasted my time. A few months went by and I forgot all about scrap metal recycling until my friends and I had removed the A/C condenser from our project car. Instead of throwing it away, I thought to give the scrap yard another try. Again, I went about collecting scrap steel and aluminum from computer heatsinks and drive casings. 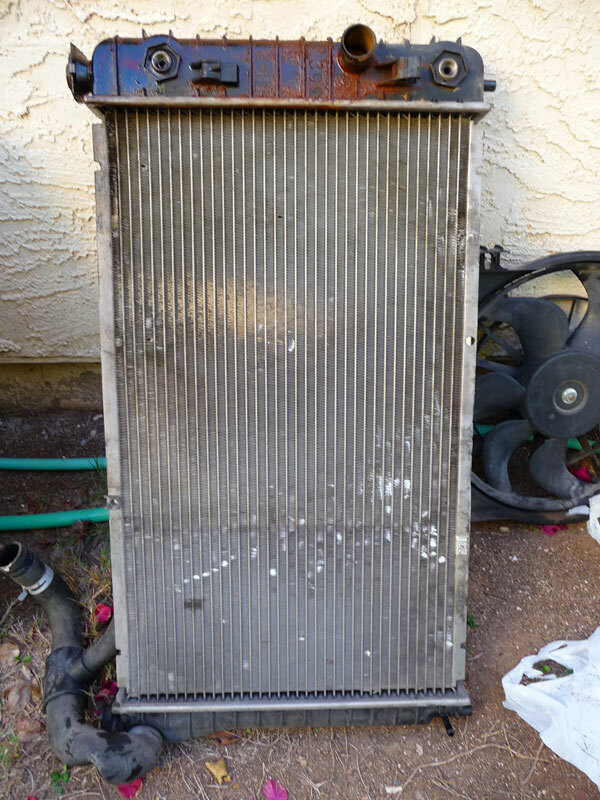 Besides the A/C condenser, I had a couple of big scores. First, someone threw away two very heavy-duty trailer hitches in the alleyway behind our house. Then, I got a large printer chassis that was made of aluminum from a dumpster. I also found an old starter motor from my car in my shed. This time, I made almost $20 bucks! I was much happier with the results from my second attempt at scrap metal recycling. However, the amount of time required to collect, store, and cash in the metal really wasn’t worth it. I have decided that scrap metal recycling isn’t the lucrative side-income cash cow that I had hoped it would be. Still, I learned a thing or two about the value of different materials and about keeping your eyes open for opportunities, wherever they may be. As luck would have it, I ended up making a third run to the scrap yard after all. I was given three large pieces of equipment from work which were going to be thrown away. They contained a lot of high-grade aluminum, so I offered to take them to the scrappers. Then, my dad gave me a huge pile of old steel tent poles he’d had sitting in the backyard. As you can see, the price on steel fell two cents per pound since the last time. Also, the scrapyard noticed that a single 12-pound piece of aluminum had some studs in it for mounting circuit boards. They claimed that their customer who actually buys the aluminum shred is very picky, and that this piece constituted “dirty” aluminum. I was a bit bummed out by that, since it meant getting $1.20 for it instead of $4.20. It didn’t take much effort on my part to make that $16 dollars, but scrap metal recycling just doesn’t produce enough money for me to be worth it. The only ones making money at this game are operating at a much, much larger scale than I ever could. I would consider the whole thing a good learning experience though. Well, I got some more pieces of surplus equipment from work. I can’t even really remember what I brought down there, but it wasn’t much. In fact, it probably cost me more than $3 bucks in gas to drive down to the place and back. My job decided to do a major overhaul of their server room this summer. They replaced several of the APC battery back-up systems with completely new ones. Me and a co-worker dismantled a huge APC electrical transformer that weighed about 150 lbs along with rackmount enclosures and old, ruined batteries. We took ’em down to the scrapper to see what we could get. This was the single biggest haul of stuff I have ever taken down there. 646 pounds of recyclable material and you still only get $50 bucks for it. It would be a nice side income if you could bring 3 or 4 loads in per month, but at that point you are literally moving tons of scrap.